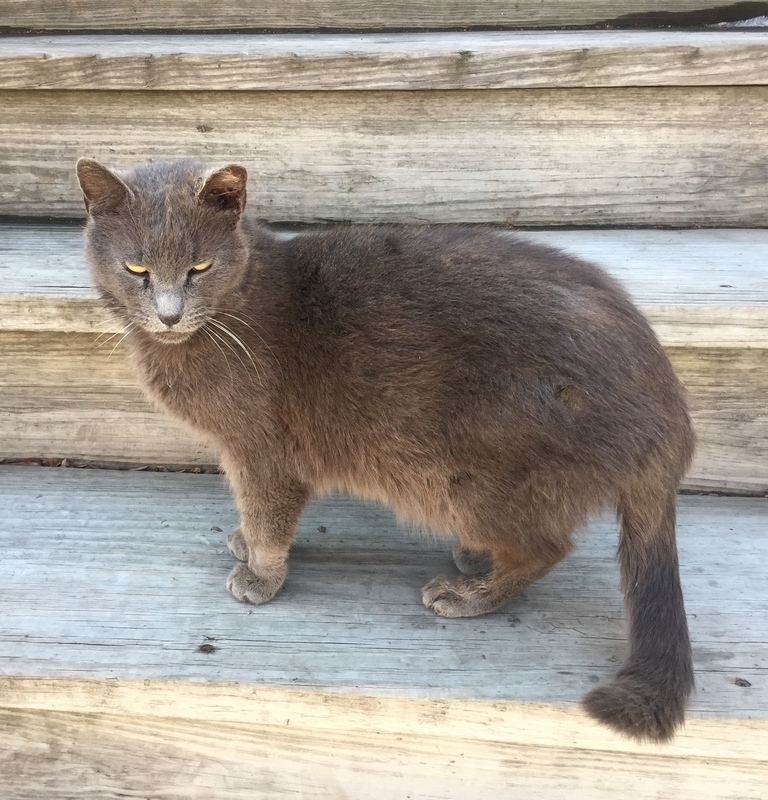 Baby Gray was TNR’d through a shelter program at least a few years ago, maybe more. Baby Gray and his two other cat colony friends are bonded and fed twice a day by a kind feeder named Penny. They have feral shelters and companionship. They hung out together all of the time. 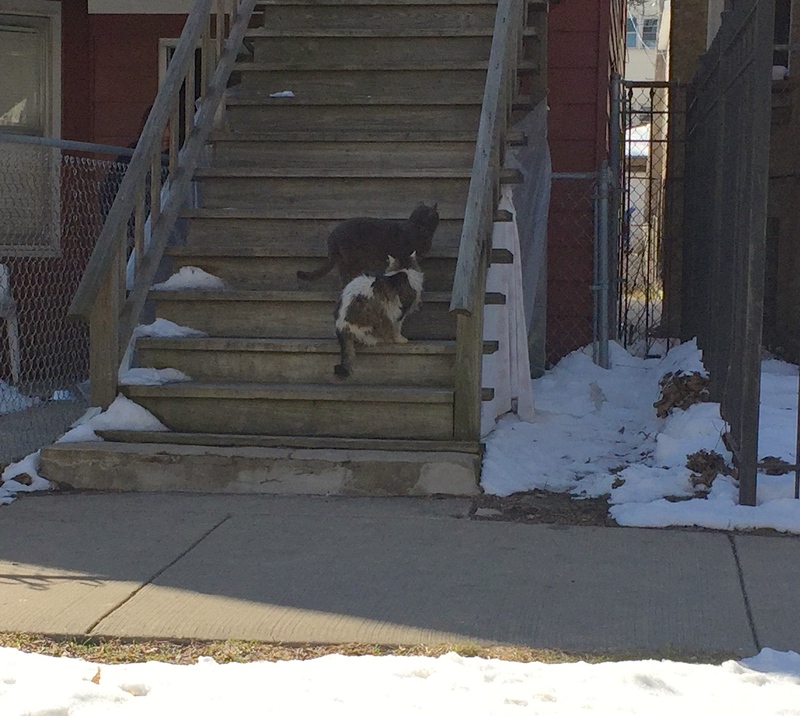 This past March when I started bringing Penny cat food to help out I could see all three cats looked pretty scruffy. Baby Gray’s left ear looked infected. I waited until May to try to start trapping because the long-haired cat has the most severe matting I’ve ever seen. Seriously, it looks like s/he’s shedding little balls of kittens off of her body, like a Gremlin. The fur needs to be completely shaved off, so I waited until the weather warmed up for that. The other tuxedo cat also has mats and is losing weight. I was hoping to trap all three at once, since there are never guarantees as to who is going to go in a trap first. After two days this week of trying to trap, Baby Gray went in. The other two cats are still not trapped. His ear now looked a lot worse. He was also drooling and had nasal discharge, so I thought perhaps he had a URI, and would need a dental. I took Baby Gray straight to our vets at Elmhurst Animal Care Center. I don’t know what I’d do without them. 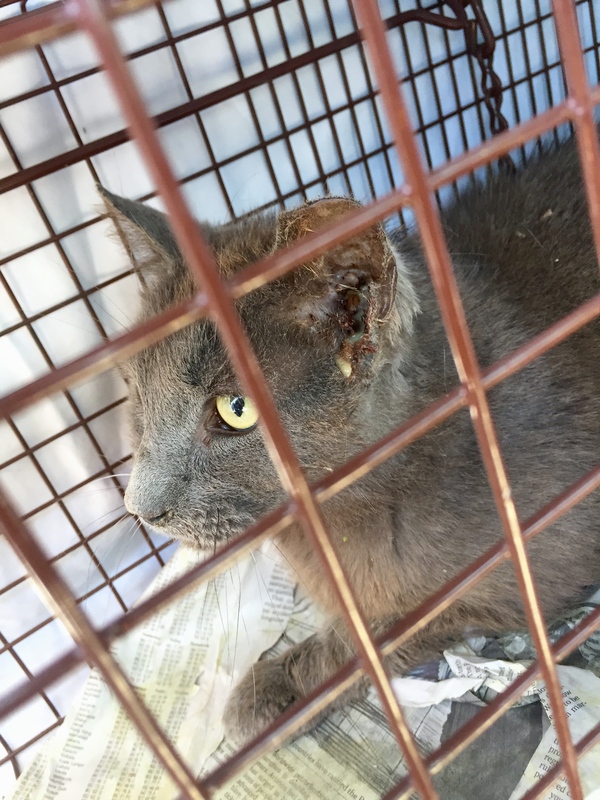 Baby Gray had to be sedated for the exam because he was feral and acting aggressively. His ear had severe discharge with a mass growing near the ear canal. But that wasn’t the main problem. 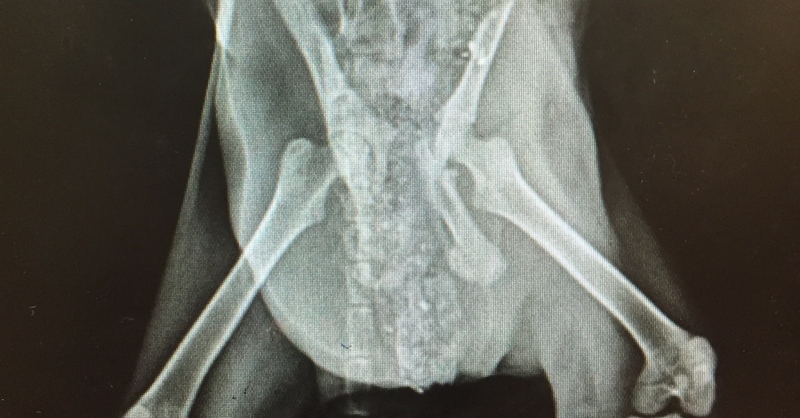 Along with severe periodontal disease with several missing teeth, he also had a necrotic mass with severe discharge under his tongue. This was cancerous – squamous cell carcinoma – and required immediate surgery to remove part of his jaw, which would only buy him a few more months to live, along with a steroid treatment. Baby Gray was dying already. Per the vet, he would die without treatment within a few weeks or months. He was euthanized while under sedation. Baby Gray is no longer suffering, and Penny cared for him as best as she could during these past few years. She gave him as much love as he would accept, and he had feline friends outside. He also did not have to die alone on the street, and I am always thankful for that. I’d like to remember him as he looked this way – feral, free, and soulful. I didn’t expect this outcome, but this year has been full of them so far. 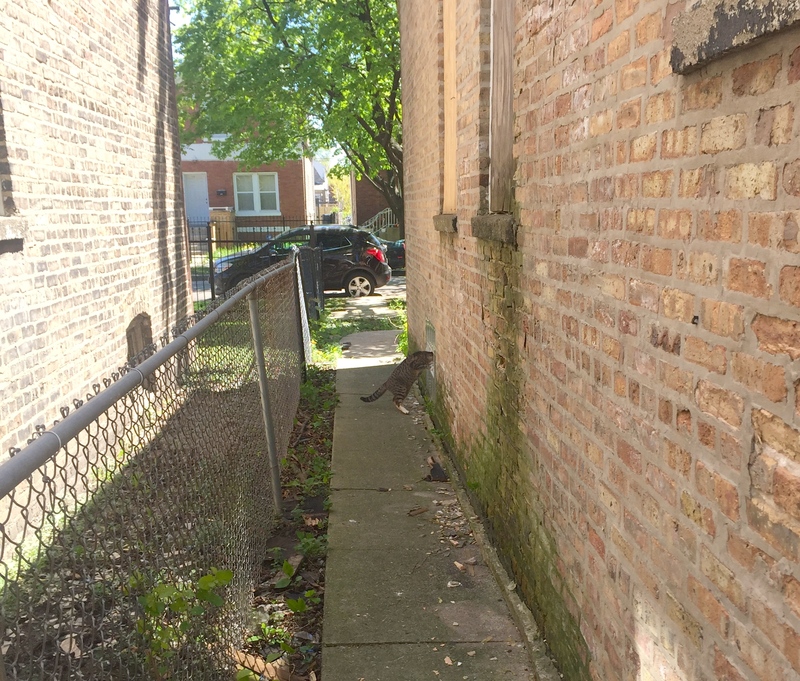 I am fully committed to continuing cat colony management for cats after they are TNR’d. I will continue to try to trap Baby Gray’s other colony friends that also need vet care. 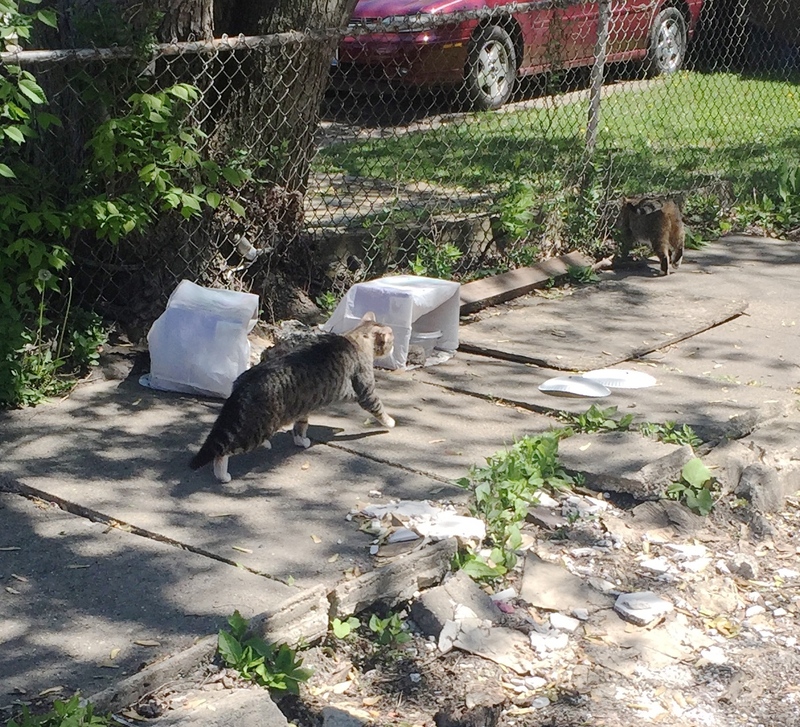 If you would like to help trap on the west side of Chicago, please contact me at [email protected] or call 773-609-CATS. 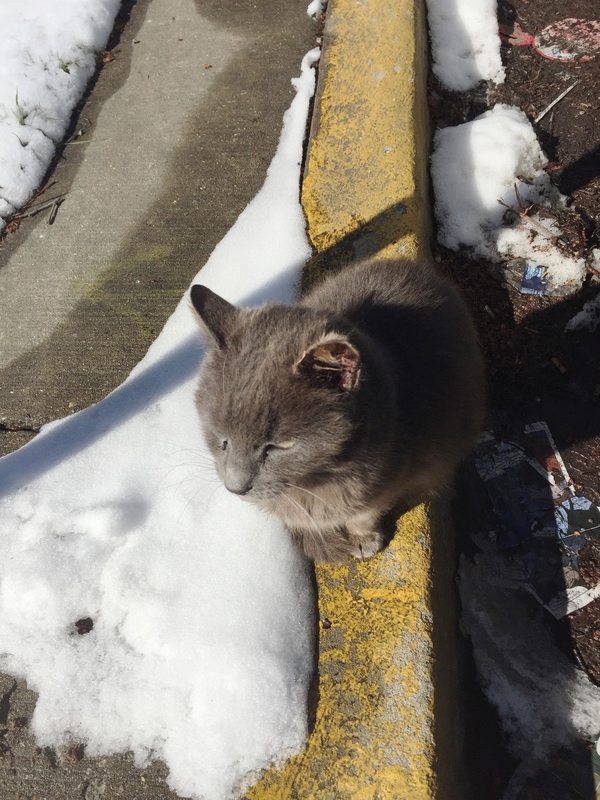 If you’d like to donate to help more colony cats like Baby Gray, you can do so by clicking the PayPal button link at the top of this page. Thank you! Mooksie showed up at his colony with a severely swollen and crumpled right ear a few weeks ago. 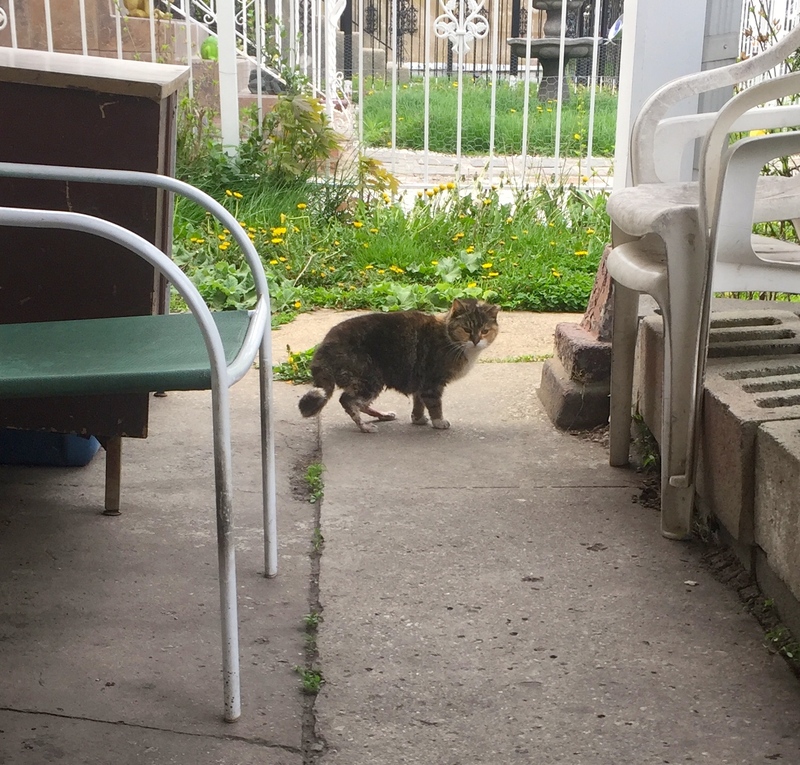 He is part of a group of feral cat colonies totaling 30-40 TNR’d cats that Jennie K. cares for in the West Humboldt Park area of Chicago. 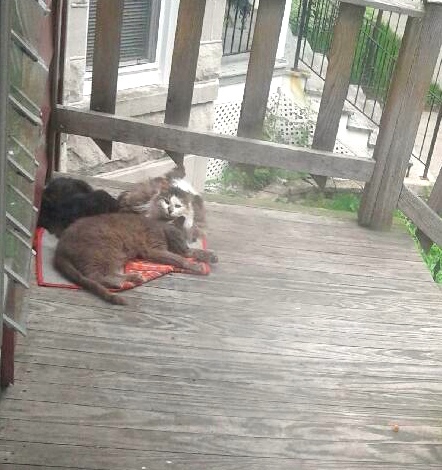 I bring cat and dog food to Jennie when I have it, because along with the colony cats, she also cares for 11 rescue cats and one dog in her home. Jennie lives on a fixed income and is on disability. She can hardly keep up with feeding, let alone vet care! My rescue friend Erica was able to trap Mooksie with Jennie’s help, and rushed him to our amazing vets at Elmhurst Animal Care Center. There they determined he had an ear hematoma that required surgery. 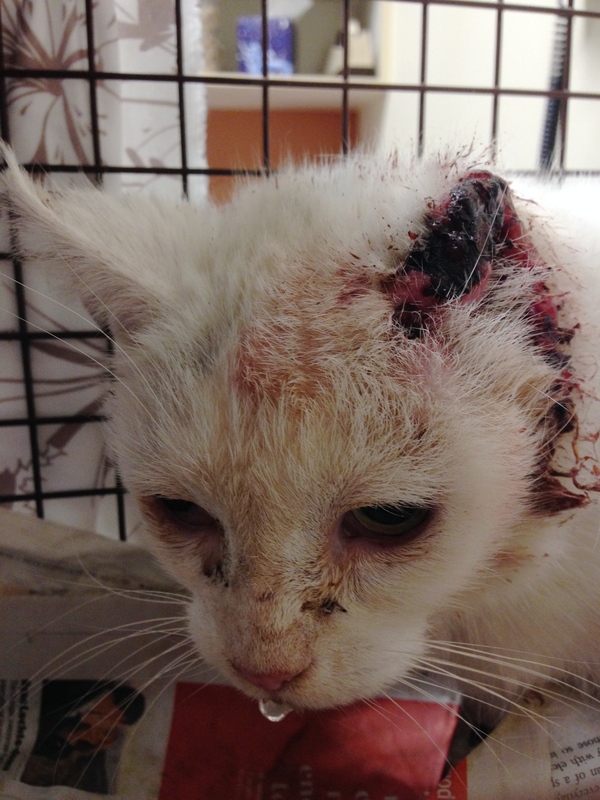 Hematomas are extremely painful initially for the cat, and are caused by trauma to the ear. They quickly can become infected and require extensive surgery. They do not heal on their own. Mooksie went under anesthesia and the vet drained his ear. They used dissolvable sutures with a small opening left in it so that the ear could continue to drain on its own. We asked for dissolvable sutures so that we would not have to re-trap him for removal later. 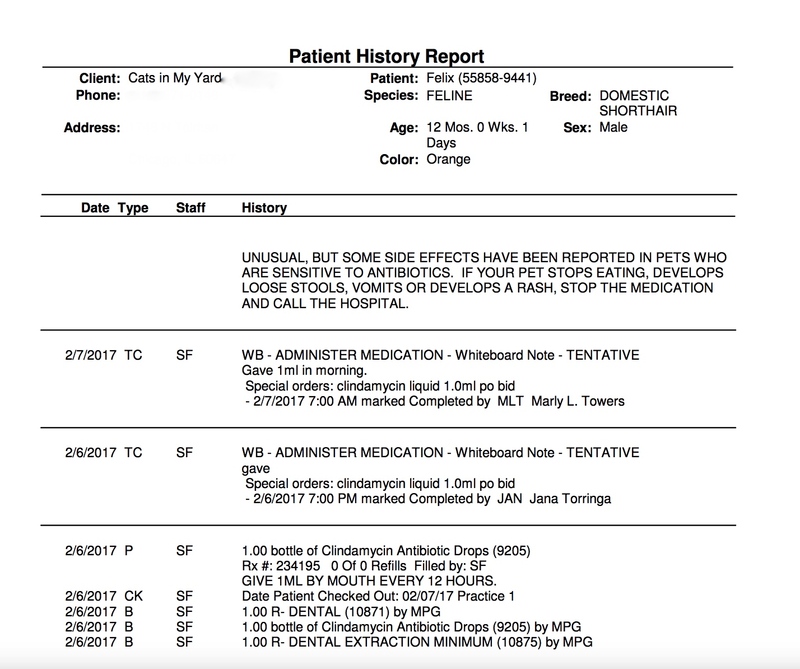 Mooksie required a catheter during surgery, antibiotics (convenia) for the infection, full ear cleaning and oti-pack ear cleaning solution, and intravenous fluids. He was also required to be hospitalized in intensive care. I returned Mooksie back to Jennie and his colony after a few days of observation and rest. His ear will be permanently folded over, but it looked really good and completely healed. I took the opportunity to also bring more cat and dog food to Jennie. I made sure Mooksie helped! He was VERY happy to be returned to his colony, and so was his bonded friend, Bootsie! She came right out to greet him at their feeding station. It was as if she was waiting for him! Jennie said she seemed to be frantic all week missing him. She thinks they are litter mates as they look exactly alike. Then they started chasing each other. 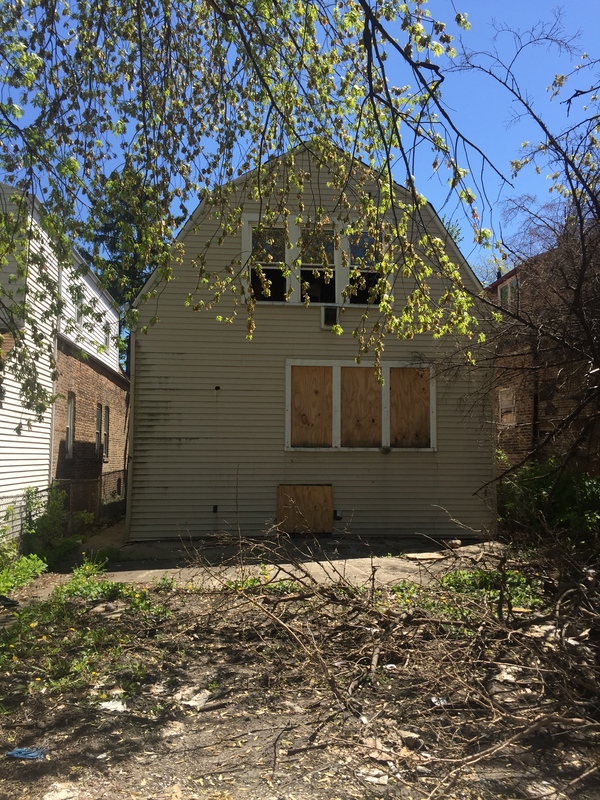 The cats all live in this abandoned building and are fed by Jennie daily. 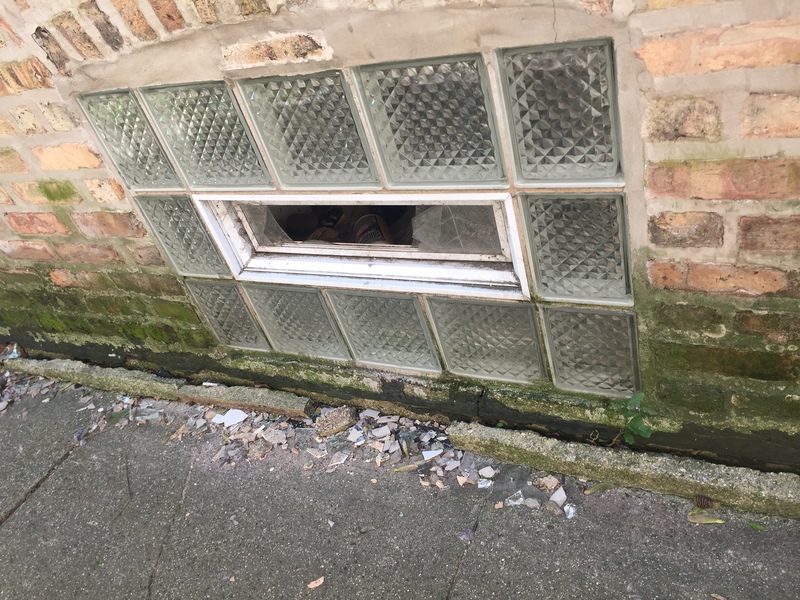 They easily access the building through this broken window. 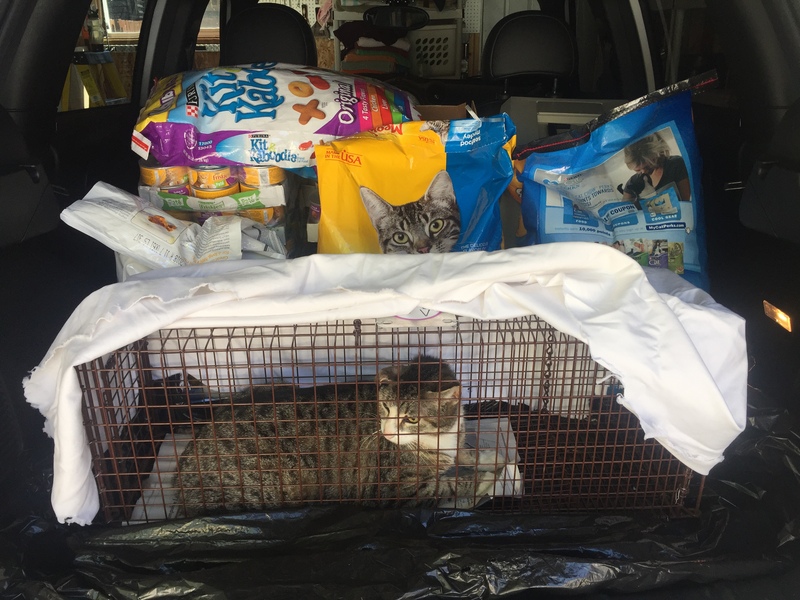 A big thanks to Erica and Jim for trapping and transporting Mooksie, to Jennie for caring for this colony, to our vets for healing these cats, and to all of you who continue to donate towards their care! This couldn’t be done without all of you. 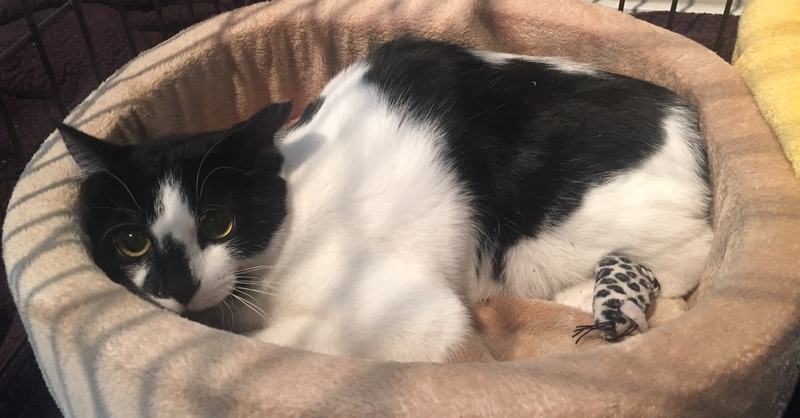 Felix was found sick in an alley by some kind volunteers on the near north side of Chicago last fall and brought to PAWS’ clinic to be neutered. 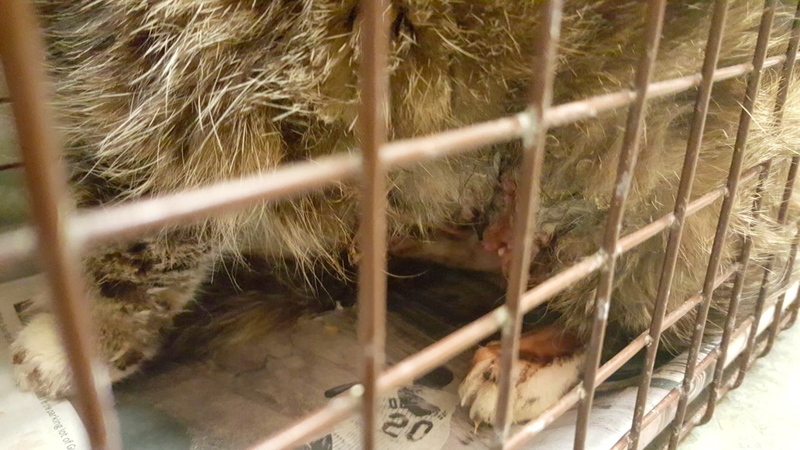 He was covered in itchy scabs from a flea allergy, dehydrated, and in need of a dental that was inflaming his gums and causing swollen glands and a fever. 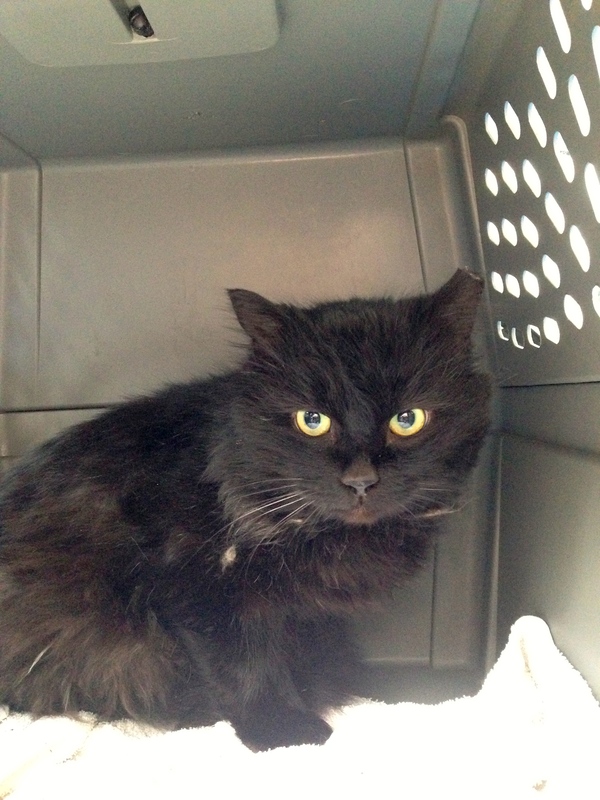 My TNR friend, Erica R., found a foster for him during his long recovery period and multiple vet visits. 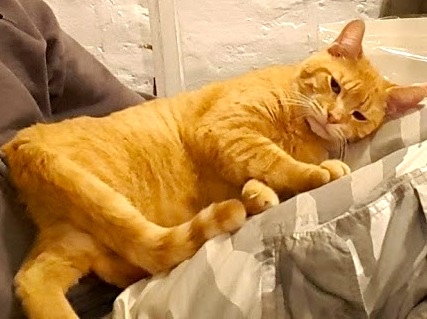 He’s a super sweet, handsome orange tabby cat, just 1-2 years old. 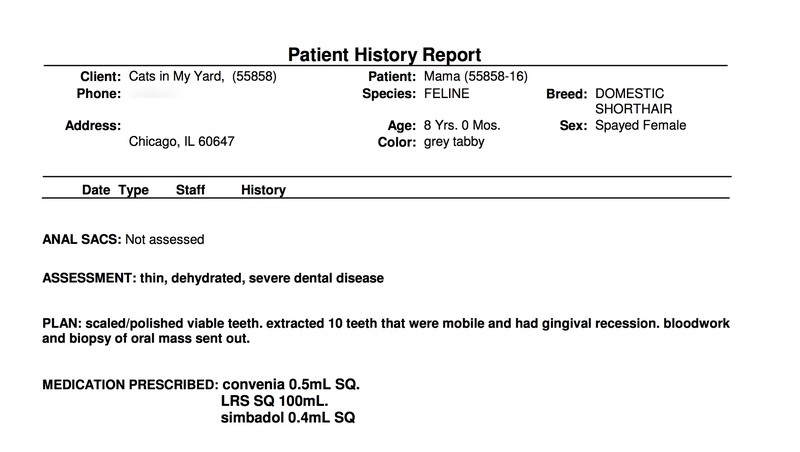 The last vetting Felix needed was his dental, and we were happy to help. Erica took him to our vet, Elmhurst Animal Care Center. He stayed overnight on some antibiotics for infection. The next day he got his dental. The total cost was $88. We are forever grateful for Elmhurst’s fantastic care. We couldn’t do this without them, as well as all of our donors who continue to help us help more cats like Felix! 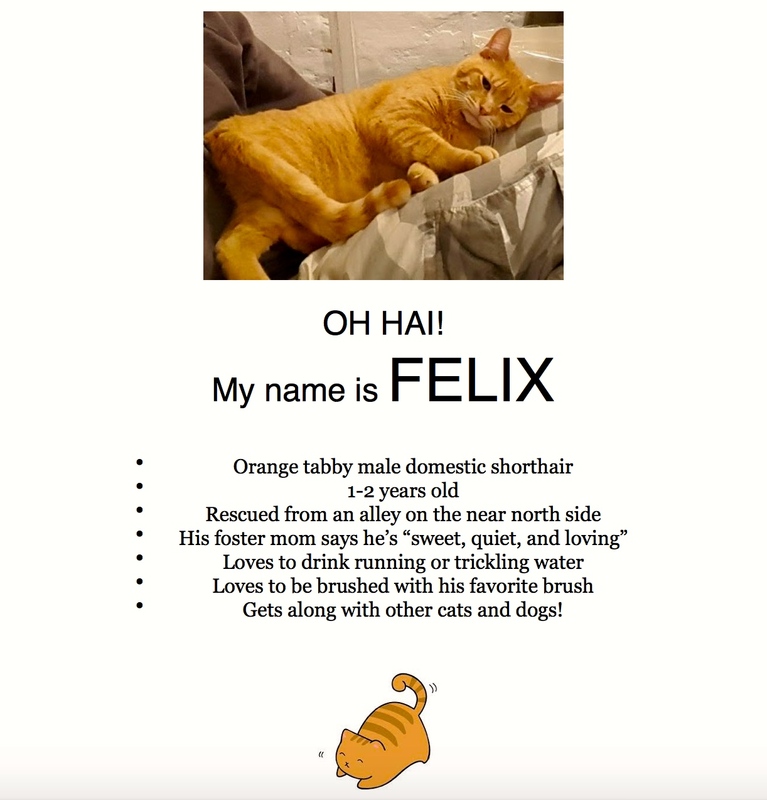 Felix is now available for adoption at the Petco on Belmont and Western in Chicago. His most recent foster described him as quiet, loving and sweet. He gets along with dogs and other cats. He’s inquisitive and playful. We know he will be adopted very soon! When we met Jean, she showed us Crystal, one of her twenty colony cats. Crystal’s left ear looked completely eaten away. Jean trapped Crystal, and Joann rushed her to our vet, Elmhurst Animal Care Center. 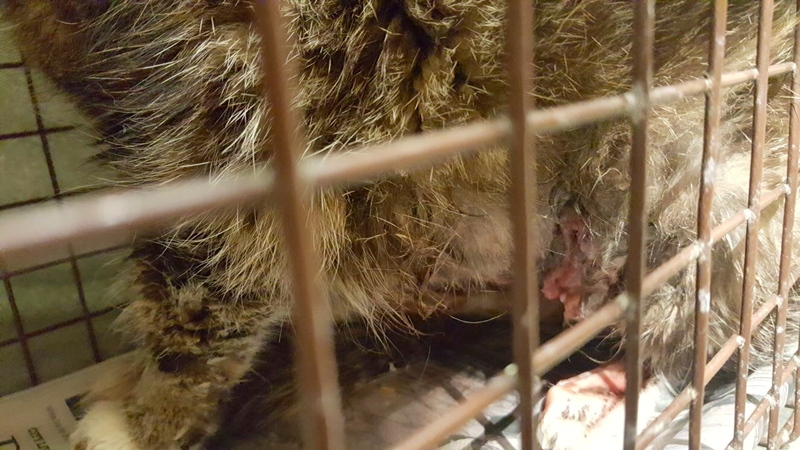 They ruled out bite wounds, and said her ear was either caused by frostbite or cancer. 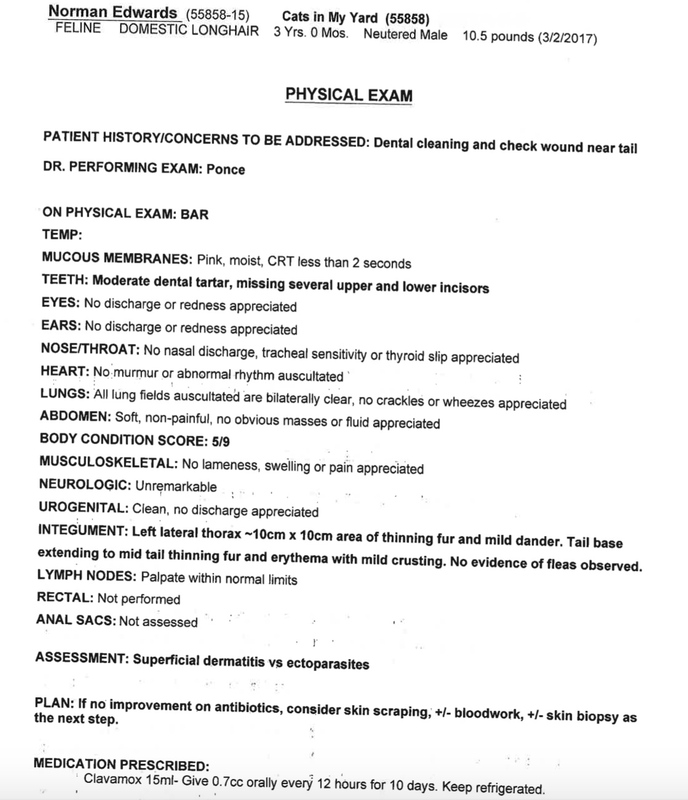 They sent out a sample for a biopsy, with results taking 3-5 days. In the meantime Crystal was hospitalized there. She had such low blood pressure they could not get a blood sample. She had a high fever, so they gave her an injection to lower it. The vet performed surgery and cleaned her ear. 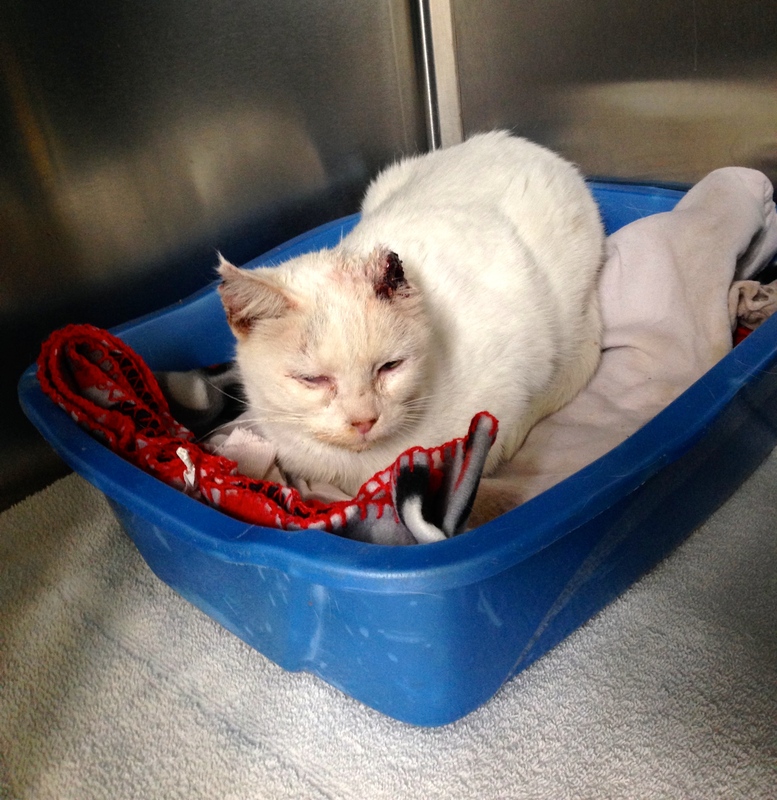 She was put on medication for the pain, and on antibiotics for infection. They discovered she did not have any teeth left. 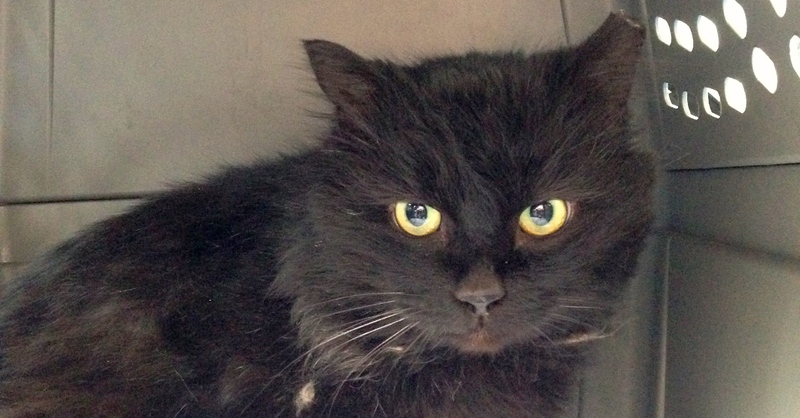 She tested positive for FIV. She was estimated to be about 9-10 years old. 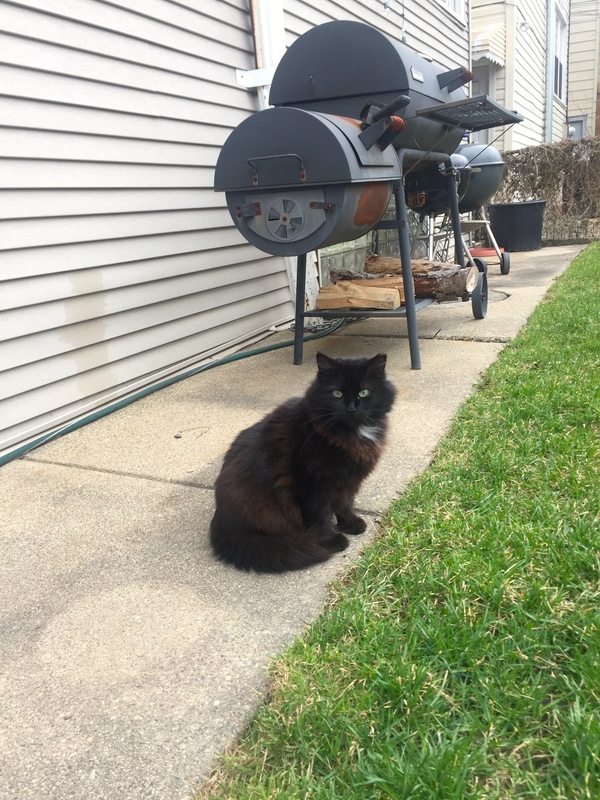 Crystal was feral and outdoors her whole life. 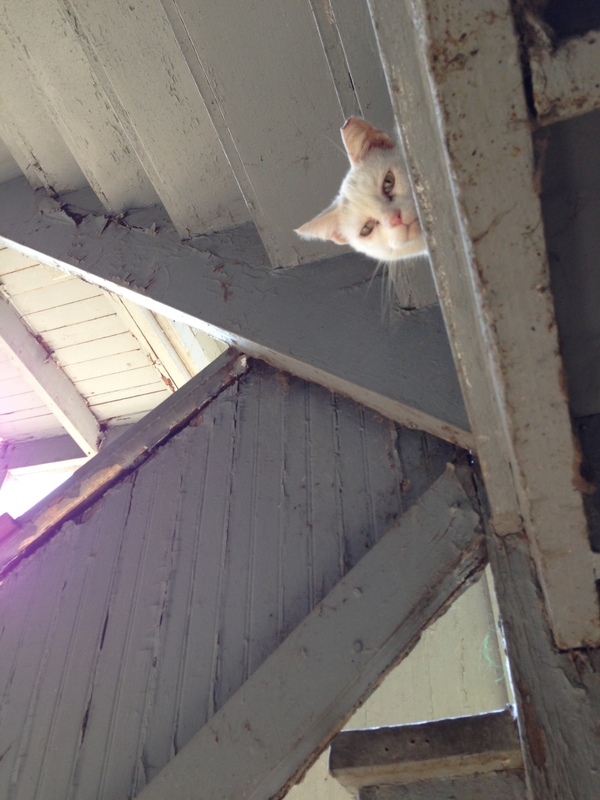 She was TNR’d in 2013. This new environment was very alien to her, and she was completely terrified. Her physical pain was hopefully eased by medicine, but she was still suffering. She did not react or respond to anyone. She refused to eat. But she was bonded to Jean, so Joann brought Jean to visit her. Crystal recognized her, and let Jean pet and even hold her a little bit. Jean was also able to feed her. A few days later the biopsy results came back: Crystal had squamous cell carcinoma. 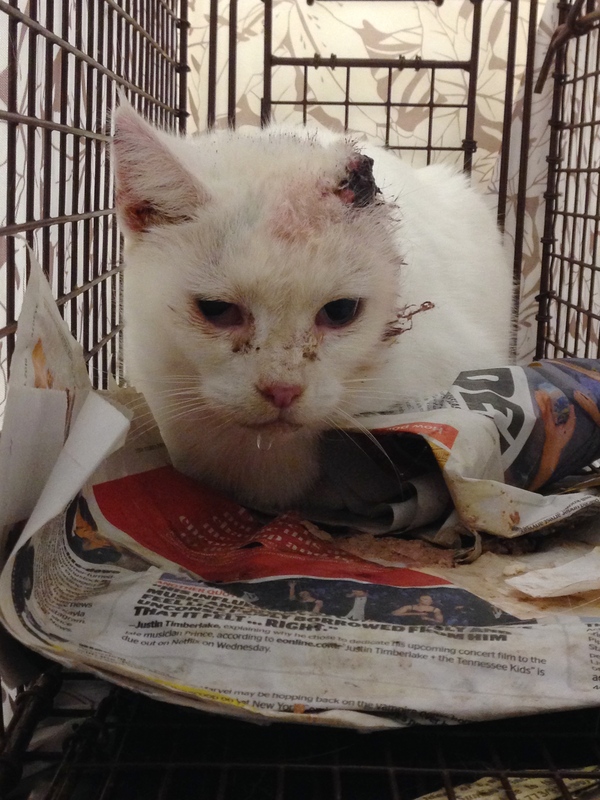 Crystal fit the profile for cats most susceptible to this type of skin cancer – she was a white cat, of about the right age, and was outside exposed to the sun. 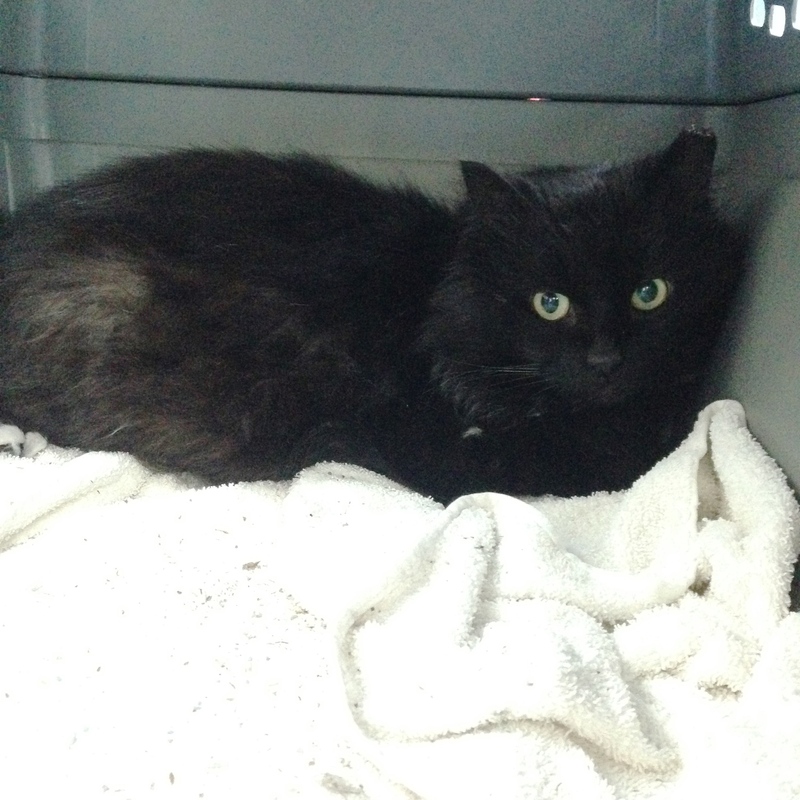 Also, her immune system was further compromised because she was FIV+. It is a very invasive cancer, and obviously this diagnosis was not early. Crystal’s entire ear was almost gone. The cancer would have continued to spread, and she would’ve required vigilant observation and continued care, most likely chemotherapy. 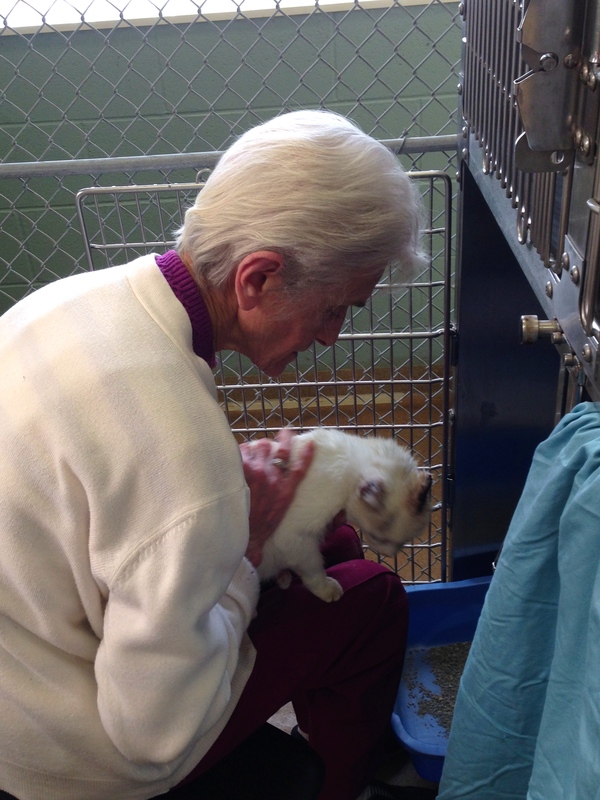 Joann brought Jean to our vet, Dr. Harris, where he carefully explained everything. Euthanasia was the most humane answer in this case. Crystal died surrounded by their love and kindness. We are also so grateful to all of you for your love and kindness, and for all of your donations. The costs of $501.40 was covered. Jean could not believe it, even though I told her right when I saw Crystal that whatever happened, we would take care of it, included financially. Jean is extremely grateful for all that was done, but is grieving now. I’d also like to especially thank Joann, who was with Jean every step of the way. The cat community is truly inspiring. May you rest in peace, Crystal. Safe travels on the rainbow road sweet girl. I’m sorry we couldn’t save you. 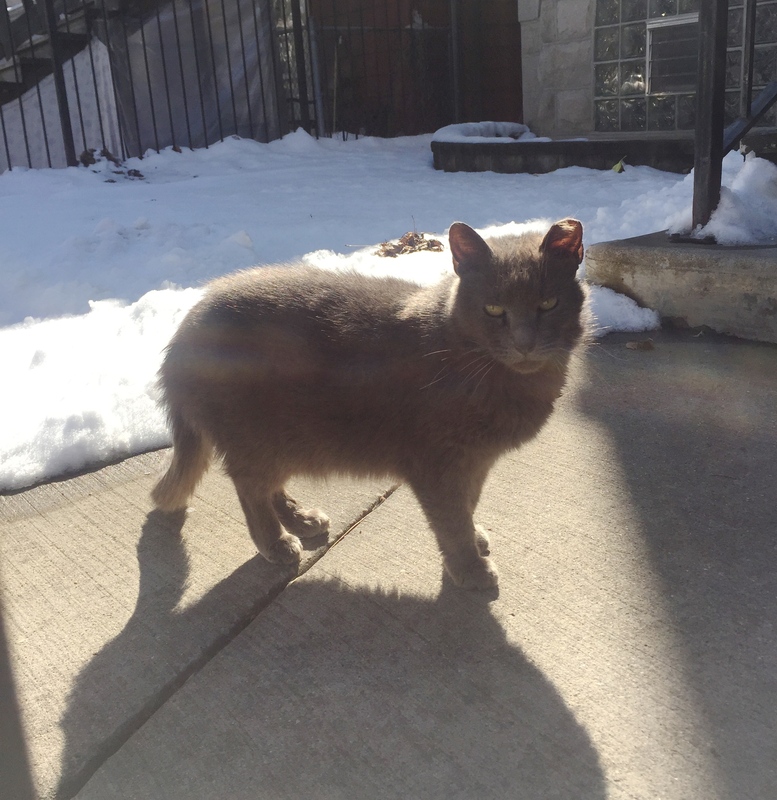 Crystal was trapped with 28 other cats living in Jean’s yard in 2013. 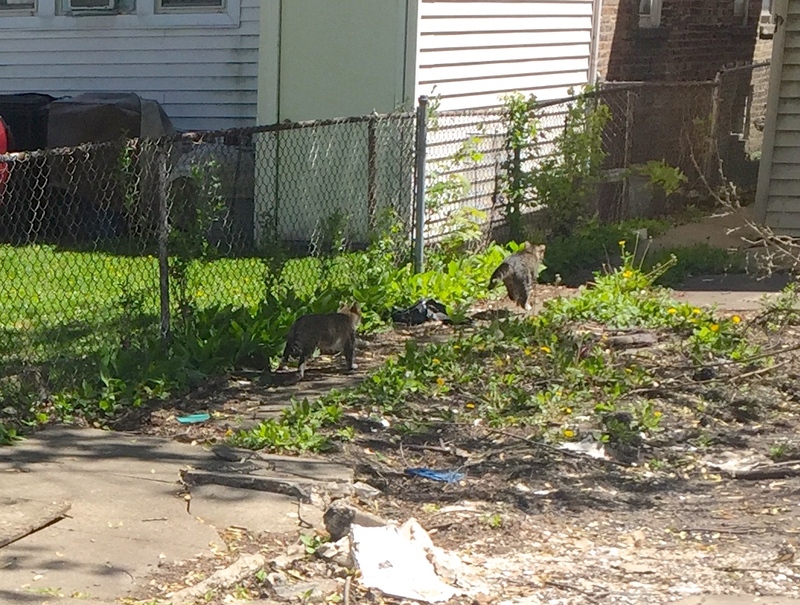 Jean’s colony is now down to 13 outdoor cats, and seven indoor cats. All are spayed and neutered. Jean is probably in her mid-eighties and walks with a cane. 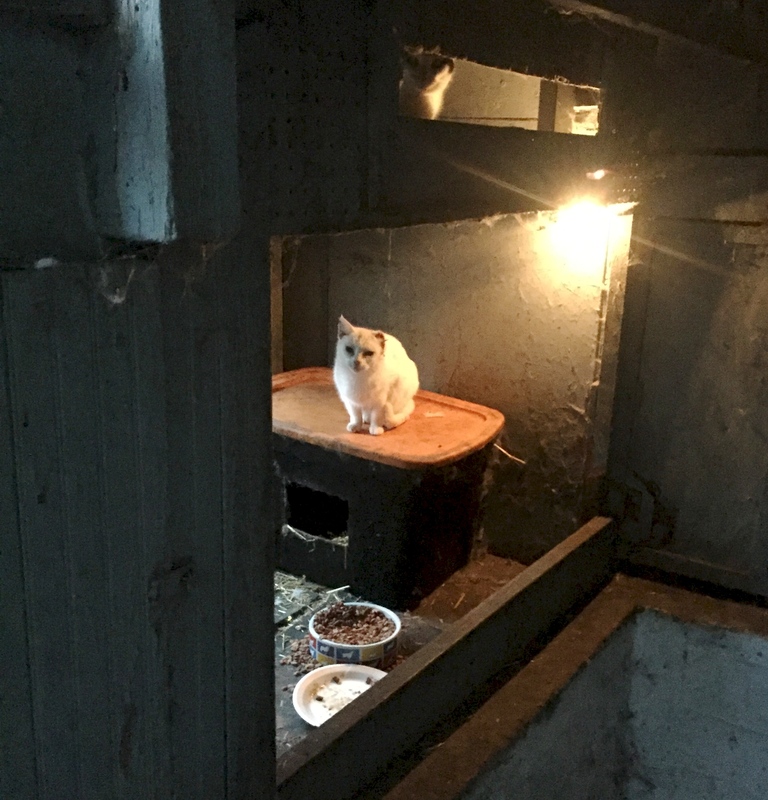 She still navigates all three floors of her home, and cares for the cats as best as she can all day by herself on a limited income. She is sharp and fun to talk to. She loves the cats dearly and cares for them as best as she can, but obviously twenty cats takes a lot of time, upkeep and money. Her house is clearly dedicated to the cats – they have pretty much taken over. 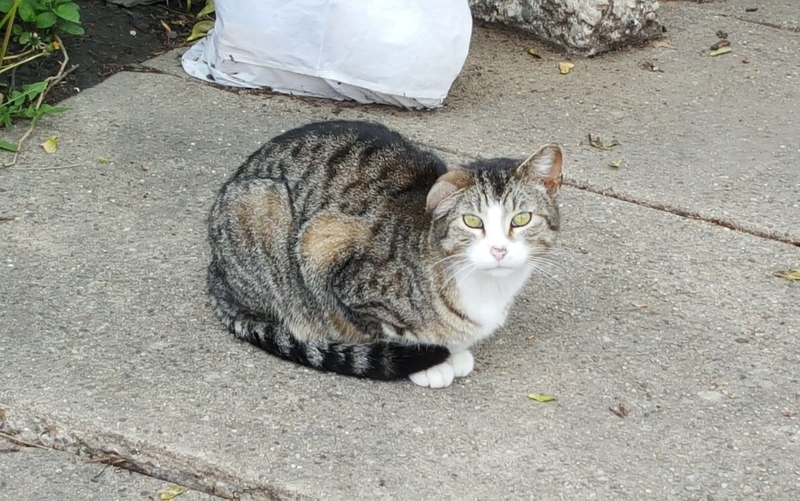 When Kim and I visited with a donation of cat food and supplies the other week, we saw that some of the cats were sick, even ones that Jean had taken to a vet on her own. Jean was humbled by the donation, even though we kept telling her that this amount of work would be difficult for anyone to handle. 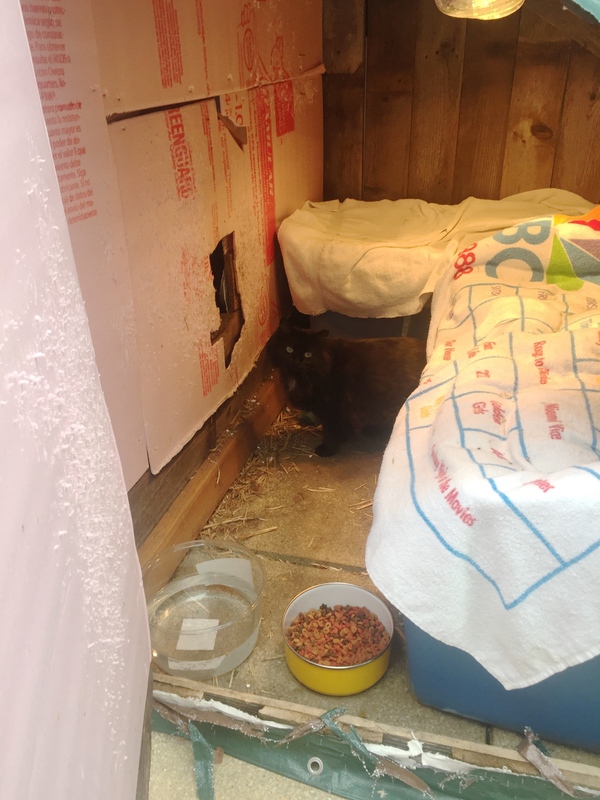 The one cat that clearly needed help immediately was Crystal, part of the outdoor colony. Her entire left ear appeared to be missing. 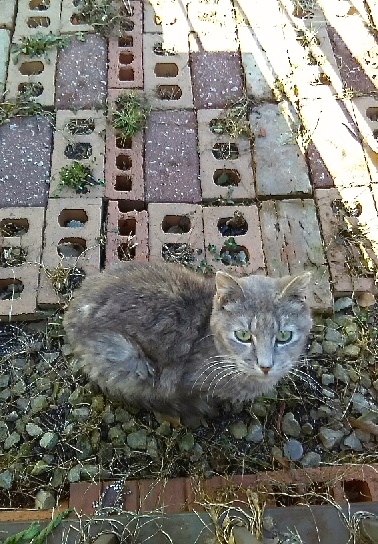 I remembered Crystal from when I posted about her TNR along with the other cats. This is what she looked like then, and the post also even contains video of her return back to the colony. She’s the last cat returned at the end of it. 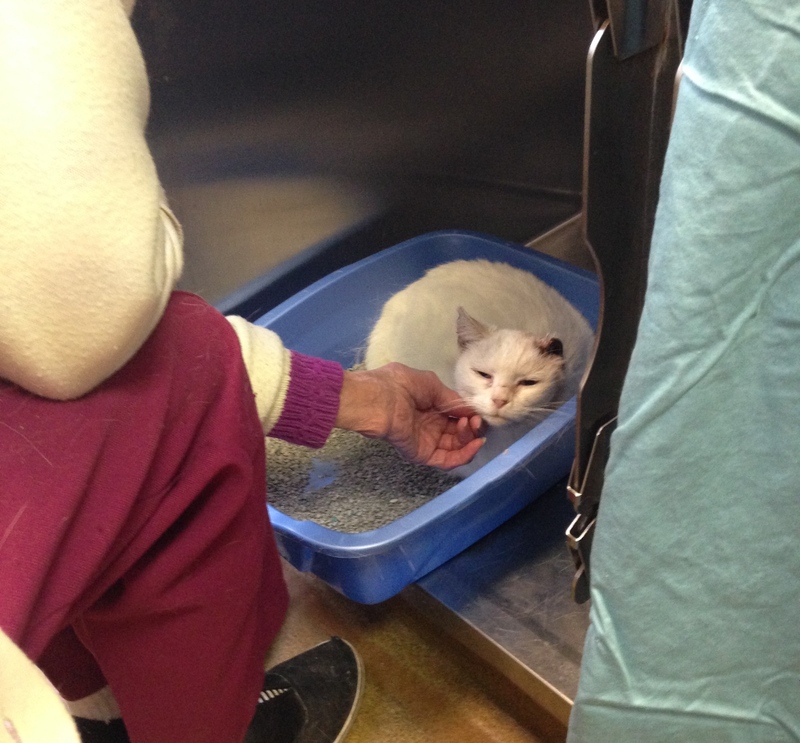 Jean said Crystal’s ear had been slowly deteriorating but was overwhelmed with vet bills already. 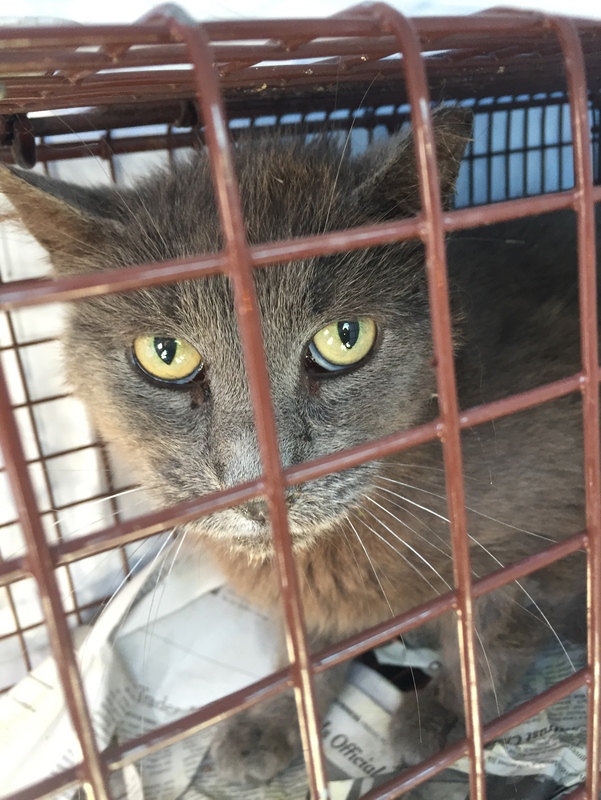 Kim and I offered immediately to trap Crystal and take her to our vet, Elmhurst Animal Care Center. Remarkably Jean said she could try to trap her herself and needed to think about the best way to do it. Caregivers know their colony the best, so this is ideal, but at the same time we didn’t really want Jean to try because of her physical condition. The traps are heavy! Well, last Friday, Jean trapped Crystal on her own! She knew where Crystal usually slept, and placed the trap against the only exit. After awhile Crystal had to go in and she did! Up close, Crystal’s appearance was even more alarming. We are so grateful to Jean to have trapped her when she did. Joann immediately took Crystal to Elmhurst that night, where she has stayed ever since. When Joann went to pick her up, Jean came out of her house carrying the trap by herself while walking with her cane as well. Seriously, kudos to Jean for her tenacity and passion for these cats. We are in awe, and want to help her any way we can. 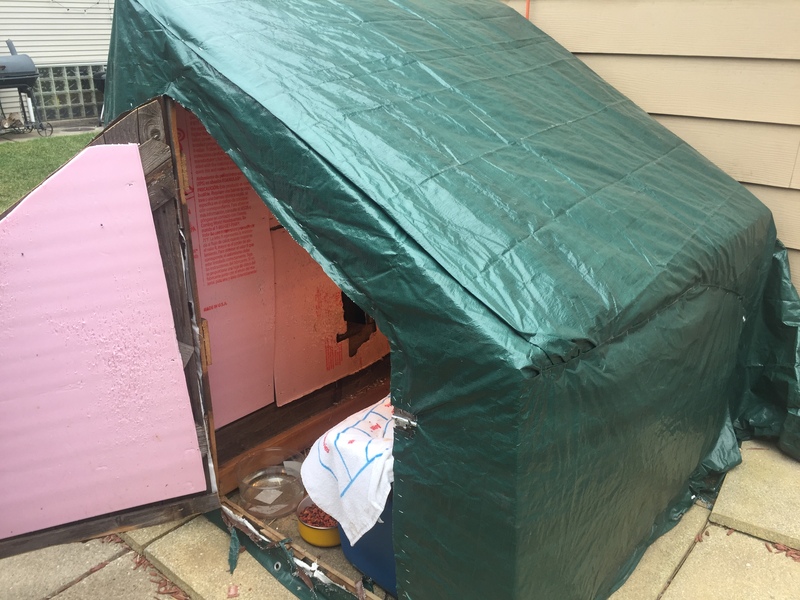 Joann said the smell from Crystal was so bad that she thought she defecated in the trap, but it was from her ear. 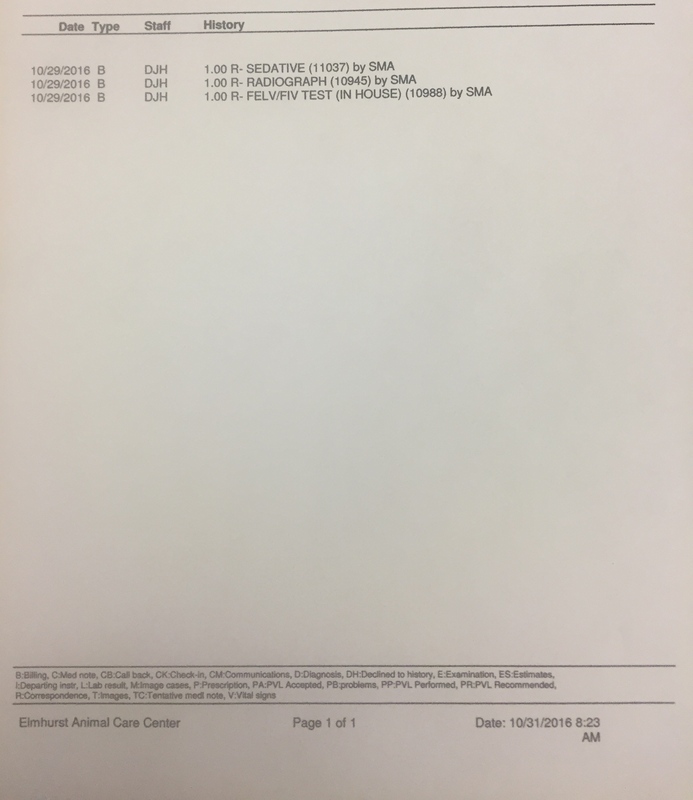 The vets said the condition of her ear was from necrosis, either from frostbite or cancer. They ruled out bite wounds. We will know the biopsy results soon. Her ear was cleaned and she was given Convenia (antibiotic) for the infection. Her blood pressure was so low that they might not have gotten enough blood for a blood sample. She had a fever of 103.5 degrees and was given an injection to lower that. She is also on pain medication so that she can rest comfortably there. She tested FIV+. They told us she had no teeth left, but her gums look good regardless. She is estimated to be about nine years old. We are so grateful to Jean for trapping Crystal when she did. 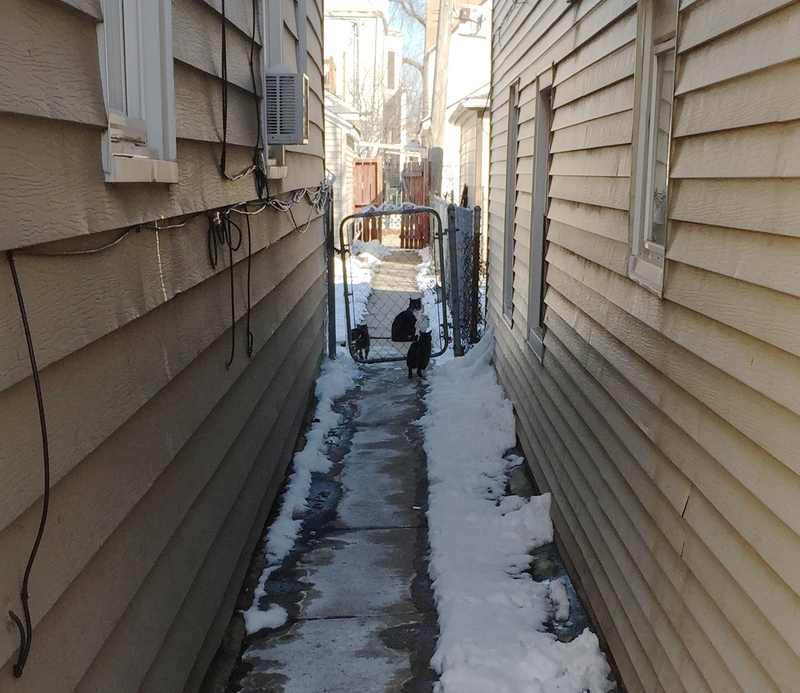 Crystal would not last that much longer on her own in the cold outside without medical care. At the same time, Jean told me she is embarrassed and doesn’t want anyone to think she is neglectful of her colony. We do not think that at all, and I really hope Jean understands that when I tell her. Joann and I have talked to her as best as we can about this. THANK YOU to Joann and Kim for all of their help this past week with this colony! And thanks to the Elmhurst vets for their expert and compassionate care, as always, so far. THANK YOU to all who have donated so far, and for all of your healing thoughts and prayers sent her way! We first met Cowbella, wobbling and weaving her way towards us, while trapping the Charlie Chaplin Colony 5am on a cold Saturday morning last fall. It was still pretty dark out so we weren’t sure what we were seeing. Cowbella walked as if she was drunk. We knew immediately something was wrong. 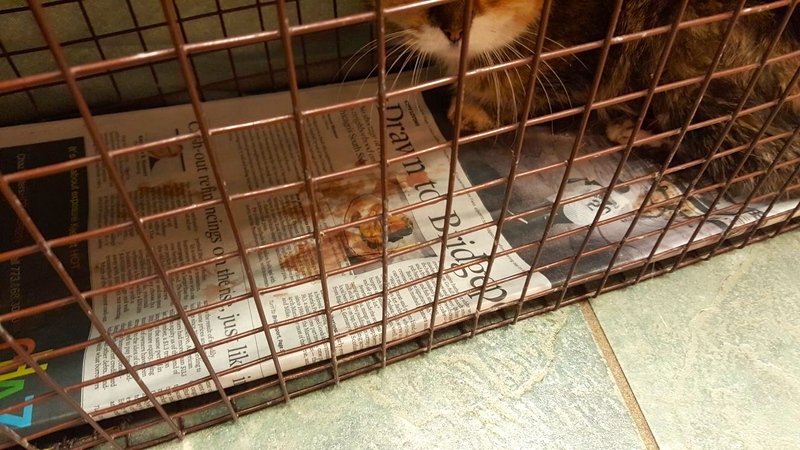 We trapped her right away, along with 16 other cats and kittens that weekend from same yard. 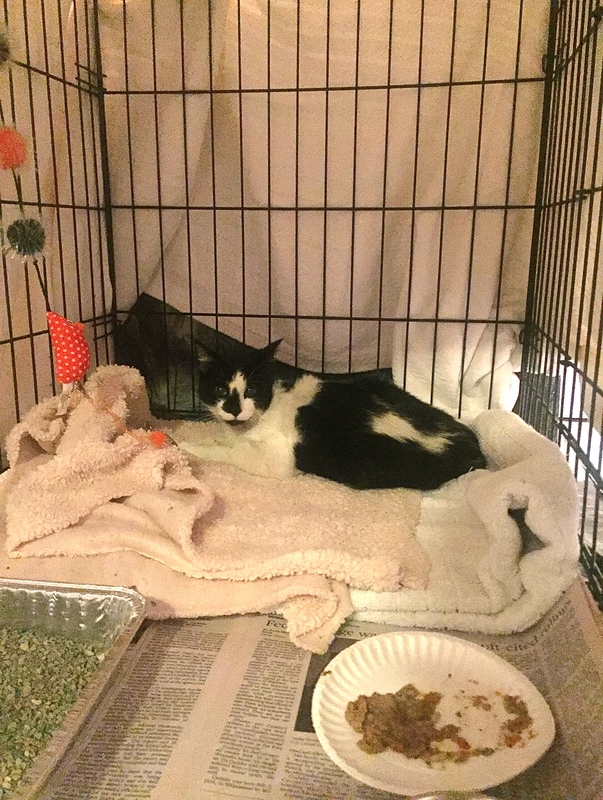 Despite everything else then going on while trapping, Kim took Cowbella straight to Elmhurst Animal Care Center to be looked at, rather than the clinic to be TNR’d. X-rays confirmed she had a broken pelvis. The injury was very new, and may have just happened that morning or night. We got her just in time as Cowbella was in no shape to be walking, and would be an easy target outside. Cowbella is still just an older kitten. She tested FIV-/FeLV-. Dr. Harris explained that she should stay crated and rested to allow her shock and injury to heal. She could not be spayed until then. 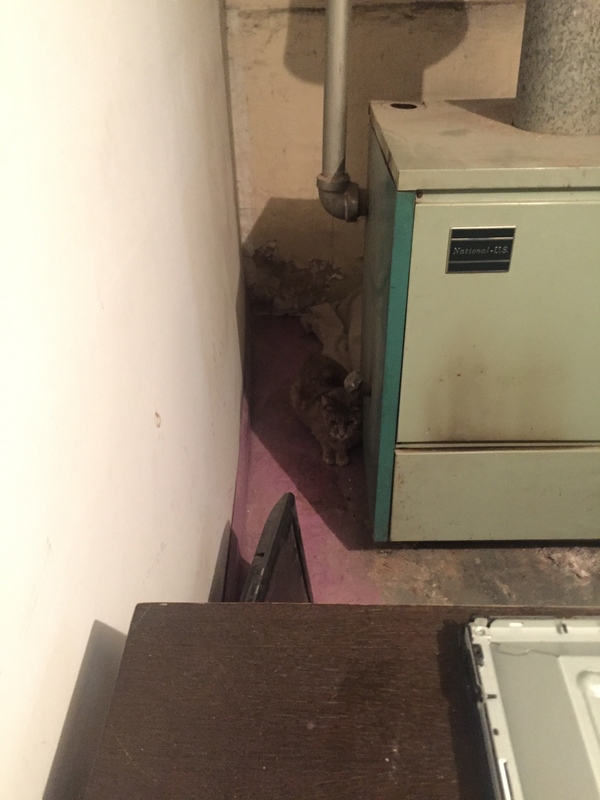 Even though she was terrified and acted accordingly, she could not be put back outside. We trust Dr. Harris’ expert opinion implicitly and followed his instructions. Cowbella was contained in a large crate in Kim’s house. And she did pretty well. Kim even put the Charlie Chaplin kitten litter in the same room with her after awhile to keep her company. She seemed to enjoy watching their antics. And why not? She probably knew them from outside, and we think she was part of an older litter born to the same mother earlier that year before we TNR’d. In mid-December Kim took Cowbella for a check-up to Elmhurst again, where x-rays revealed her pelvis had healed and did not require surgery. She would not be able to jump or run very well, but was ready to be spayed. 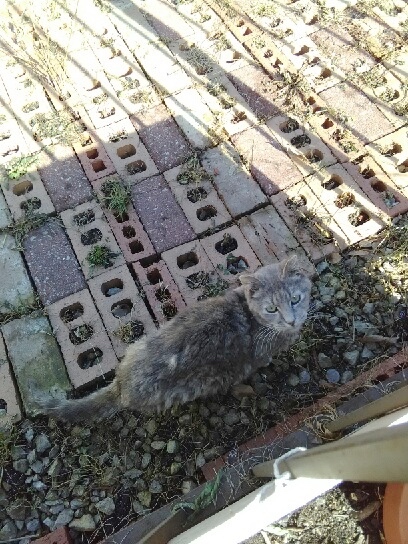 Because of her mobility issues and the danger it puts her in, she should never be put back outside. Cowbella needs to be an indoor only cat. 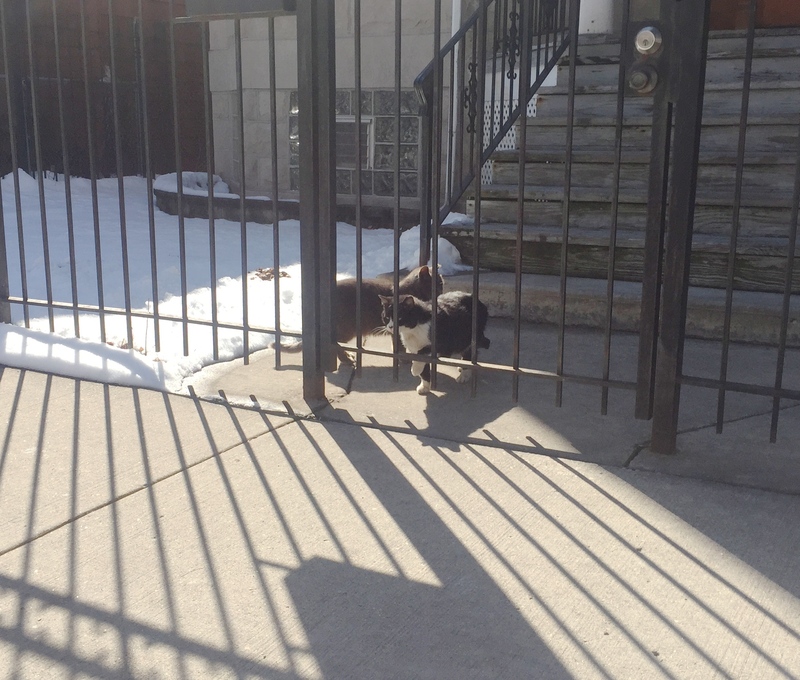 I consulted with Jenny Nahrwald, assistant director at PAWS Chicago’s Spay Lurie Clinic, and her opinion on Cowbella. She then consulted with Dr. Von Waldau, their chief vet, who agreed to do her spay surgery for free with a careful examination. Cowbella was spayed just the other week and Jenny transported her afterwards to Kim’s home. 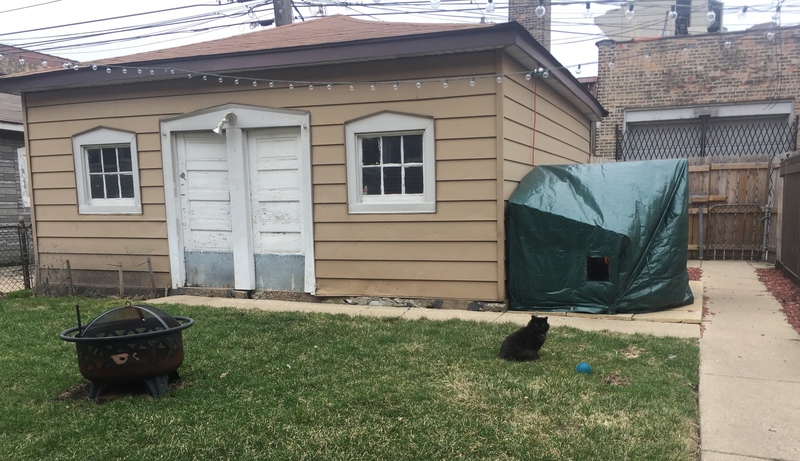 Once again, we are so grateful for the care and help PAWS Chicago has provided for us for more than a decade with many of the cats we rescue off of the street. Cowbella is now recovered from her spay surgery and up to date on all vaccinations. 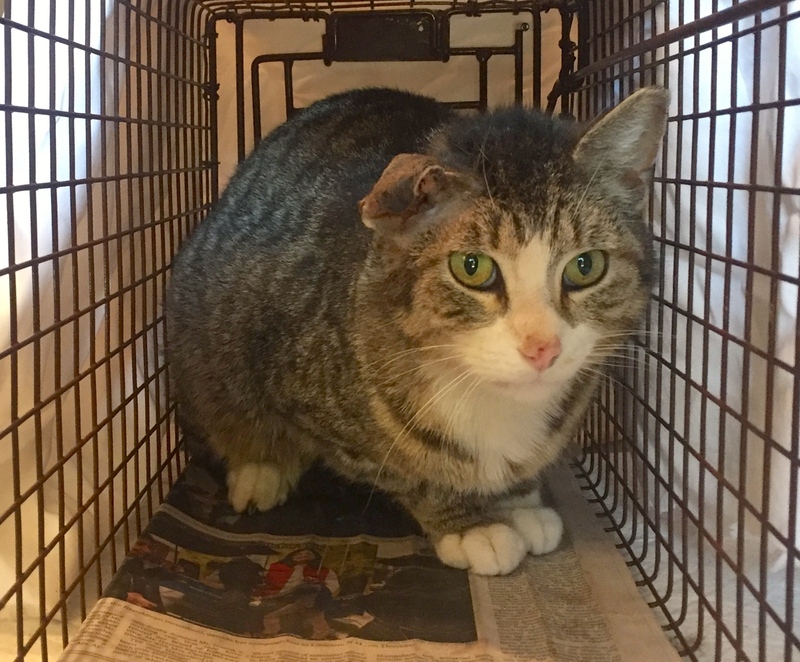 She is a shy, sweet girl that loves to be scratched under the chin, and seeks out pets once she’s comfortable. She definitely likes other cats. She has a lot of energy because she is still very young, but knows how to move carefully because of her past ordeal. She will make a wonderful pet with the right person who will give her time to learn about her new indoor home. Thank you all you have donated so far! We could not do this without you.